For a great tasting, delicious shake combine 1 serving (1 scoop) of MyShake™ with 6-8 ounces of cold water (depending on personal preference for desired thickness). Always drink 12 to 16 ounces of additional water for each protein shake consumed. MyShake Protein Blend (Whey Protein Concentrate, Milk Protein Isolate, Micellar Casein), Natural And Artificial Flavors, Non-Fat Dry Milk, Salt (Sodium Chloride), Soy Lecithin, Modified Gum Acacia, Cellulose Gum, Xanthan Gum, Carrageenan, Guar Gum, Potassium Chloride, Sucralose, Acesulfame Potassium, MCT Oil Powder, Conjugated Linoleic Acid. 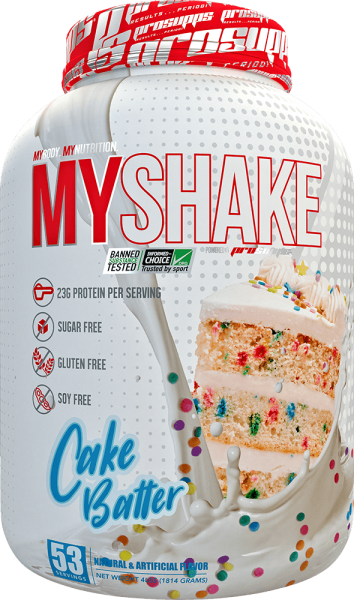 MyShake Protein Blend (Whey Protein Concentrate, Milk Protein Isolate, Micellar Casein), Natural And Artificial Flavors, Salt (Sodium Chloride), Soy Lecithin, Modified Gum Acacia, Cellulose Gum, Xanthan Gum, Carrageenan, Guar Gum, Sucralose, Potassium Chloride, Acesulfame Potassium, MCT Oil Powder, Conjugated Linoleic Acid. MyShake Protein Blend (Whey Protein Concentrate, Milk Protein Isolate, Micellar Casein), Cocoa Powder (processed with alkali), Natural And Artificial Flavors, Salt (Sodium Chloride), Soy Lecithin, Modified Gum Acacia, Cellulose Gum, Xanthan Gum, Carrageenan, Guar Gum, Acesulfame Potassium, Sucralose, Potassium Chloride, MCT Oil Powder, Conjugated Linoleic Acid.